I am from Springfield, Missouri, but moved to Florida for college. While in college at the University of Florida, I played for the UF women’s rugby team and served on their board. I also spent three years there working for a high-end custom jewelry store. I went on to graduate from the University of Florida with my Bachelor of Science in Biology. Medical device sales allowed me to combine two things I loved, Biology and sales. My competitive nature gives me the drive and determination for the industry and the product naturally interests me and makes learning about it a joy. I knew medical device sales was where I wanted to be before graduating from college. After much research, I was told about MSC and thought it would be the perfect transition. I graduated from MSC and signed an offer letter about two months later. ZeroFee recruiting made my experience seamless. I was contacted by a client of theirs and will now be working for that very company. A friend of my fathers has a son that attended a program at MSC. I did. I chose to go to a program in Denver rather than one closer to my home. It was intimidating not knowing what kind of other students there will be or how well you will do in a new environment, as well as class. The upfront cost is very daunting, scary even after you learn everything and feeling so much more prepared for the industry. I know now that I wouldn’t have gotten the job without it and it makes the cost worth it. One of the things that stuck with me the most was the friendships that you make. A sense of support goes a long way when interviewing for a new job. Having resources to answer questions and go through all of it with, the training and the interviews gives you the confidence you need to succeed. All of the instructors made sure they were available and always willing to help; the whole staff did. 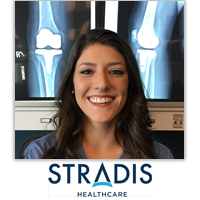 The interview process for the job with Stradis began with an email reaching out to set an interview. I had my first phone interview with their Director of Sales, she then set an interview with their COO and one more interview again with their Director of Sales. We then set a date and I was flown to Chicago to do a face-to-face interview with each of them as well as their HR Director. After the three in person interviews that day, the four of us went to lunch, did a tour of the facilities and then I was put back on a plane the same day. I was notified the next Friday that I had gotten the job. The knowledge of the industry was probably the biggest factor. I knew what they expected and didn’t feel out of my realm. I felt like the industry advice came into play along with the technical training. It also gave me the confidence to ask for the job because I knew I was prepared for the position. Again, I really think the knowledge of the industry, what to expect, what they expect and what to focus on afterwards was the most valuable. DC Hoffman was a great instructor who was always honest and gave us realistic expectations. If you are like me and you don’t have industry experience and do not want to apply for a job you are not prepared for, MSC will make the difference. After the program, I knew I could do the job, and talk about the industry. That gave me the confidence to go after the job in the interviews. Confidence is tough in front of some of theses high-up business types and if you can keep your confidence you will be able to present the best side of yourself. That to me made the program worth it.